FEATURES/SPECS Spruce up the look of your favorite stock broker's desk with this bull & bear themed desktop clock. 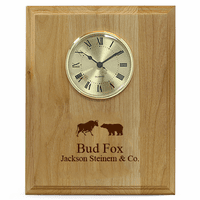 This quartz, battery operated clock is made of solid red alder wood with polished brass accents. The clock itself has a tiered brass bezel, white dial and black appointments. 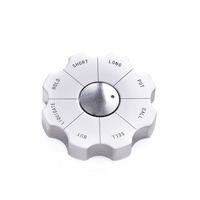 The brass tone base has four feet to rest comfortably on any surface. 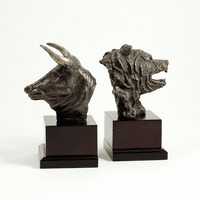 The face of the wood clock comes with a bull and bear getting ready to duke it out, the symbol of Wall street. 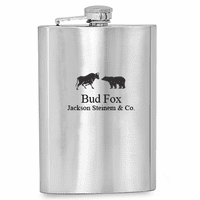 Add your own custom engraving to this for a perosnalized touch. 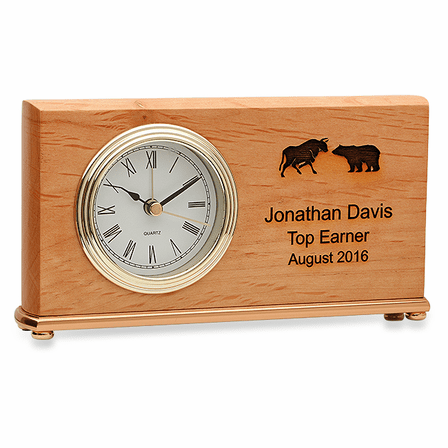 This desk clock for financial professionals will liven up any trader's desk.